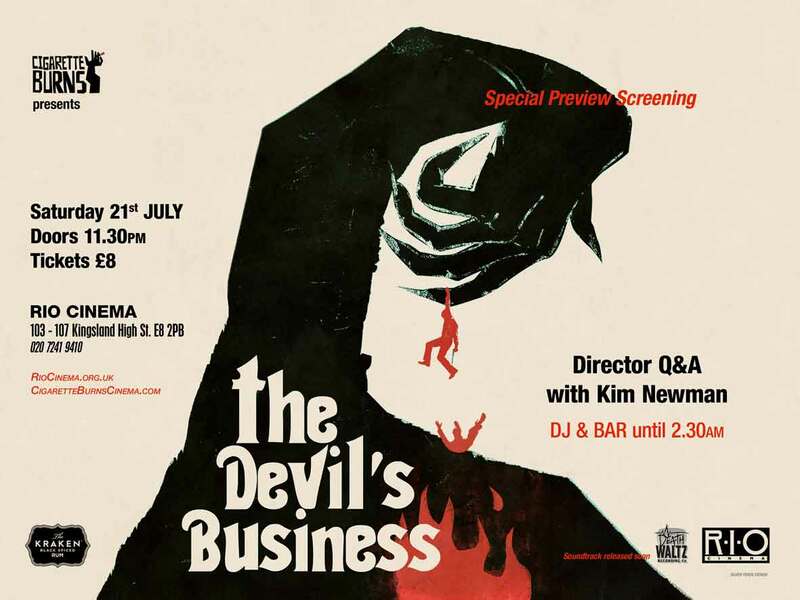 So tonight we follow the torch up Kingsland Rd to the Rio Cinema with a preview screening of Sean Hogan’s Brit Horror The Devil’s Business, followed by a Q&A with Sean Hogan himself, hosted by the one and only, Kim Newman. 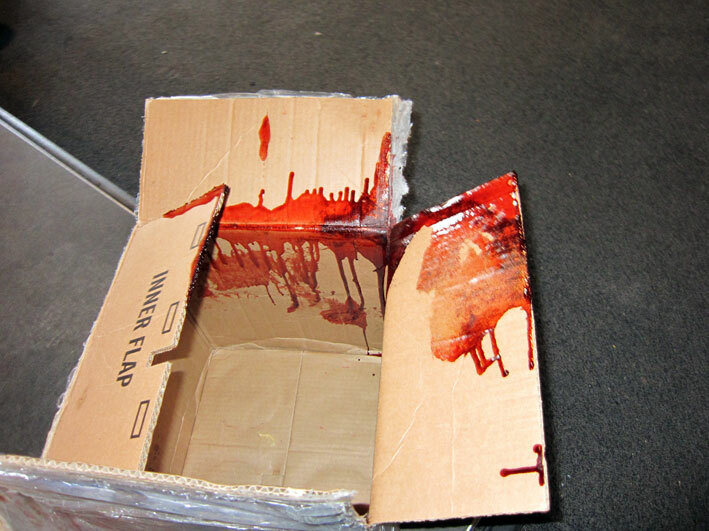 However, a bloodied box with a note taped to it has appeared at my door this morning. These things happen at CBHQ… This is perfectly normal. Often, in indie horror, special effects get recycled for reasons of cost. Weighing in at about six kilos the gross dead baby was made originally for Harmony Korine’s Trash Humpers for a scene where the eponymous garbage frotters microwave a kidnapped infant and then cut it open, eating its innards. The scene was eventually cut by Harmony for being too unpleasant. When Sean was writing the script for Devil’s Business he visited Dan Martin’s effects studio (at that point situated in a series of dimly lit railway arches) to see what could be salvaged, borrowed or pinched to gore up the movie. Gross dead baby was quickly a favourite of Sean’s and got given a quick refurb and paint-job to become a sacrificial offering to the lord of the flies himself. Now you have the opportunity to take home this soft, grimy, unpleasant piece of cinema history to do with as you will. Use him in your own indie horror film, fill him with pot puri or simply use him as an unnecessarily harsh cautionary tale for your own real kids. The possibilities are endless. Dan has kindly offered to give away this “grimy, unpleasant piece of cinematic history” and if memory serves, I remember hearing a tale about a scene in Human Centipede 2 that it appeared in, only to end up on the cutting room floor. Some lucky boy or girl will get to walk home with their very own dead baby tonight,, so I suggest you do some homework and start learning Dead Baby Jokes, the best one wins.  This entry was posted in achtung, News, Now, Sean Hogan. Bookmark the permalink. ← To art and beyond! How many babies does it take to paint a house? Depends how hard you throw them.